This year Australian flowers and foliage have become a popular accessory for stylists and decorators. So, it’s not surprising to see them used in Christmas decorating. The subtle colours found in Australian wildflowers perfectly match the current interior trend colours like blush pink and sage green. With the popularity of botanical themes there are many faux Australian flowers now available. For my tree I chose four. The deep pink of the waratha, the eucalypt spray, and the sculptural protea (not strictly Australian but commonly found here). Clusters of purple seed pods also complement the overall look. Our tree also features metallic highlights in the copper decorations and gold sprays. I couldn’t resist adding a bit of ‘traditional’ Christmas decorating so glass baubles in a pale green are interspersed throughout the tree. In its execution the tree looks quite random but look closer and repitition occurs, just like nature! The golden wattle is Australia’s national flower. The bright yellow spray works well with these copper magnolia flowers especially against the dark green of a Christmas tree. 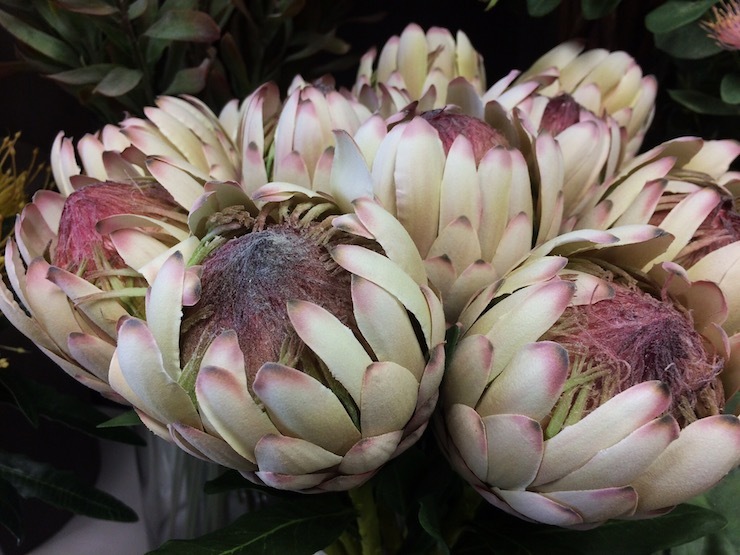 The protea are perfect for a Christmas wreath. You don’t need many and the fake can be mixed with natural dried flowers, pinecones, and seed pods. You can collect them yourself it makes a great Christmas craft project.